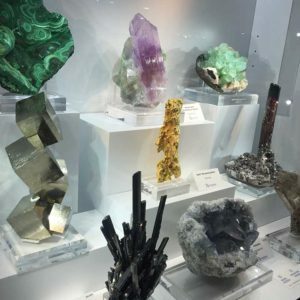 This February, Metalwerx director Lindsay Minihan and I were fortunate to venture to Tucson, AZ for the Tucson gem show. Every February, thousands of vendors from all over the world come to Tucson to sell their gems, stones, tools and various other goods. The entire city is inundated with over 45 shows, each housing hundreds of vendors. It is an international event of an overwhelming size and scale where you can find nearly anything! In the two short days we were in Tucson, we managed to see three shows. 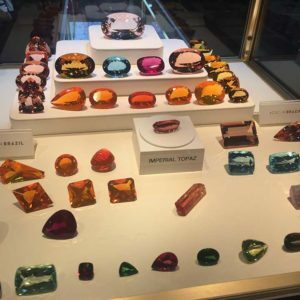 The first we visited was the AGTA (American Gem Trade Association) GemFair. This show is not only impeccably organized, it is beautifully laid out with wide aisles, friendly vendors, and carpeted floors that dampen the “oh my!” and “wow!” exclamations coming from those shopping. Buyers from all over the world, including The Smithsonian, come to this show to find rare and interesting specimens for their collections. First, we headed to Rare Earth Mining booth. Bill Heher from Rare Earth had personally invited Lindsay and me to attend the AGTA show and we happily accepted! Rare Earth had the most interesting assortment of stones. Corals, opals and countless trays of druisy are just some of the eye-catching specimens they had for sale. We could have spent all day in just their booth! We talked with some interesting people like Fernando Cortes, a distributor for B9Creations (a 3D printer manufacturer) who described his journey, starting as a bench jeweler to owning and operating a multifaceted jewelry design and fabrication business in Los Angeles, Red Door Distributions. We also had some time to talk with David Aizenman from Pepetools who was in the A&A Jewelry Supply booth demonstrating the new oval disc punch! 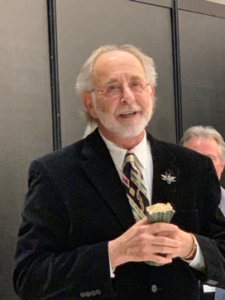 One of the highlights of the AGTA GemFair was watching Alan Revere receive the Benne award, given to him by The American Jewelry Design Council. The Benne Award is named after Benvenuto Cellini and has been given only four times over the past 30 years. The award is presented to a person who has made significant contributions to the jewelry field. Among many of Alan Revere’s accolades, he is well known for his books and being the man behind the Revere Academy of Jewelry Arts in San Francisco, which he ran for over 35 years. The second show we went to was GJX (Gem and Jewelry Exchange). This largely international show hosts vendors from all over the globe like Poland, Australia, Africa, and India. Among the vendors at GJX, we found our friend Diane from Dikra Gem! She showed us some of the amazing cabochons that David Kramer hand cuts and pairs. Last but certainly not least was the To Bead True Blue show at the Casino del Sol. Located just outside of Tucson, this show was worth the drive for so many reasons. Seeing the desert landscape is such a great way to clear your head, especially when you have been looking at stones all day! Not only was there an amazing selection of tools, stones and beads, some of our favorite Marketplace vendors had booths at this show! We bumped into Ashley Bunting from Xuron, Anie Palagian from Jooltool, and Rita Punnulla and Michelle Knabbe from ImpressArt. We also met some great new vendors! Curt Fargo is the owner and president of Micro-tools, a company from the Midwest specializing in pliers. However, Micro-tools carries way more than just pliers! 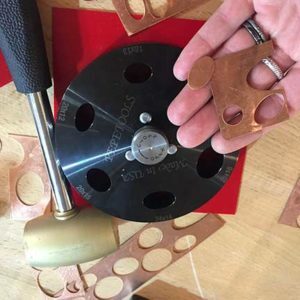 Melissa Muir, who has over 21,000 subscribers to her jewelry Youtube channel, was in the Micro-tool booth giving a great demo on cuff bracelets using a Fretz hammer. 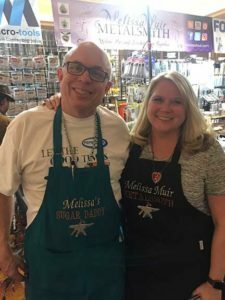 Melissa is a wealth of knowledge, a fabulous metalsmith and Curt is a proud supporter of her! 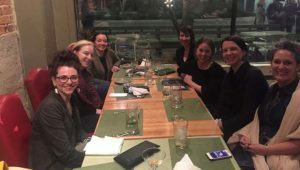 On our last night, we met up with some lovely jewelry ladies (Laura Wood, Anna Johnson, Kari Rinn, Elizabeth Garvin, Stephanie Ellis) to eat dinner talk about our Tucson treasures. We had a great discussion about ethically sourcing materials and the difficulty in purchasing quality goods from a trusted source. 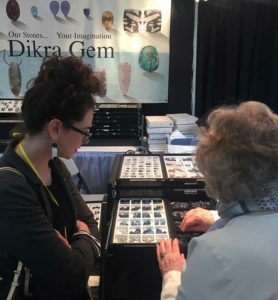 Lindsay and I shared our experience at the AGTA GemFair, explaining AGTA’s belief that the gem trade should be as transparent and ethical as possible and that all vendors participating in the show are heavily vetted. AGTA also has high disclosure standards for the enhancement of gemstones. This limits issues for shoppers allowing them to feel good about the purchases they make and the vendors that they are supporting. It also builds a trusting relationship for vendors providing quality goods and clients who are more likely to leave happy and repeat business. To say that Tucson was overwhelming would be an understatement! 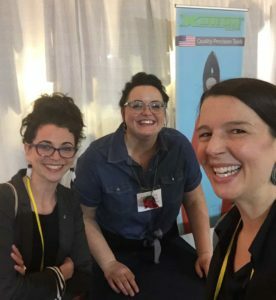 We made so many great connections with vendors, jewelers and friends on our trip. 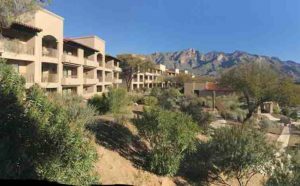 Two days was not nearly enough time to spend to what Tucson has to offer. Pre-register for shows for easy check-in. Bring lots of water and snacks. If you are going to regret not buying it, buy it! Marking my calendar and saving my pennies for next year, Tucson 2020! Thank you for an amazing 2018 at Metalwerx!